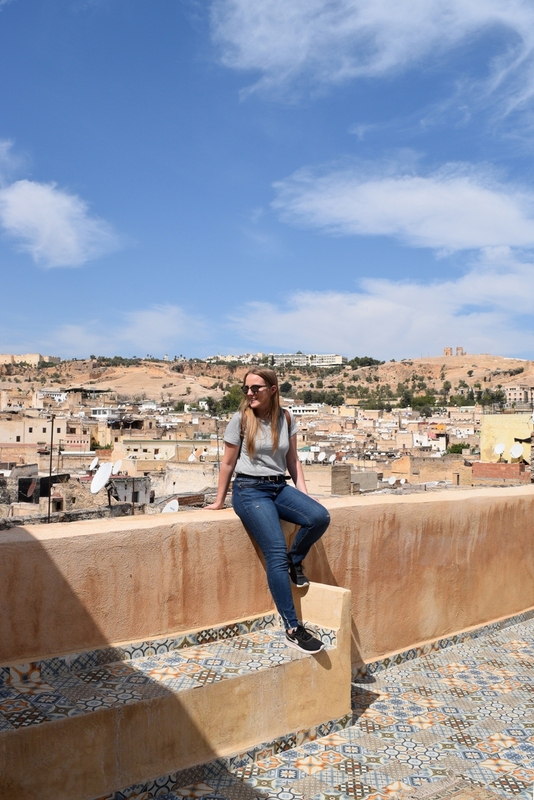 Our trip to Fez was split into two days. 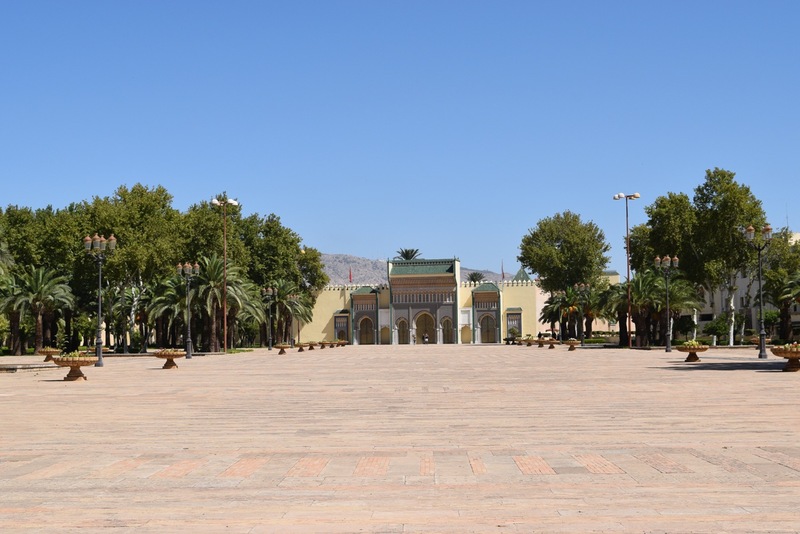 On the first one, we were exploring with a local (our wonderful airbnb host) and managed to see two things – Palais Royale (only from the outside) and Dar Batha Museum, that houses a rich collection of traditional Moroccan arts and crafts. On our second day of exploring the city, we were alone. 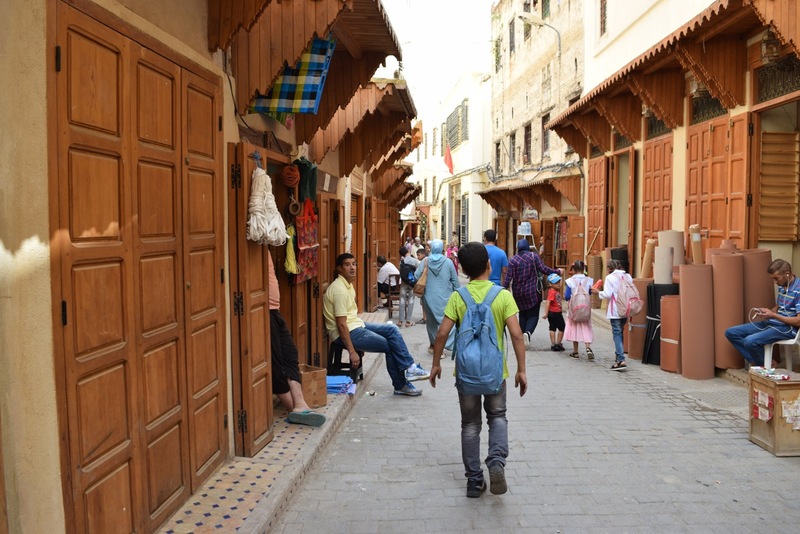 In the morning, we confidently entered the medina through the Bab Boujloud (also known as the blue gates). 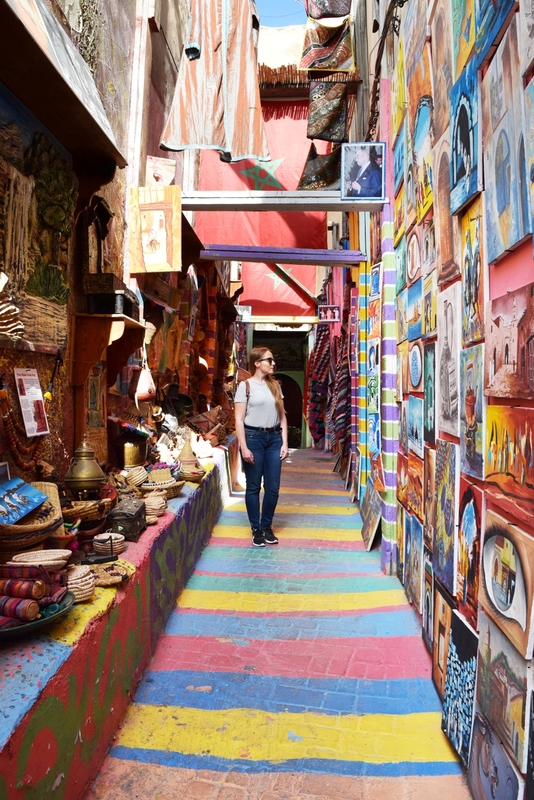 Surprisingly, it didn’t take us long to find the rainbow street, the first must-see on our list. 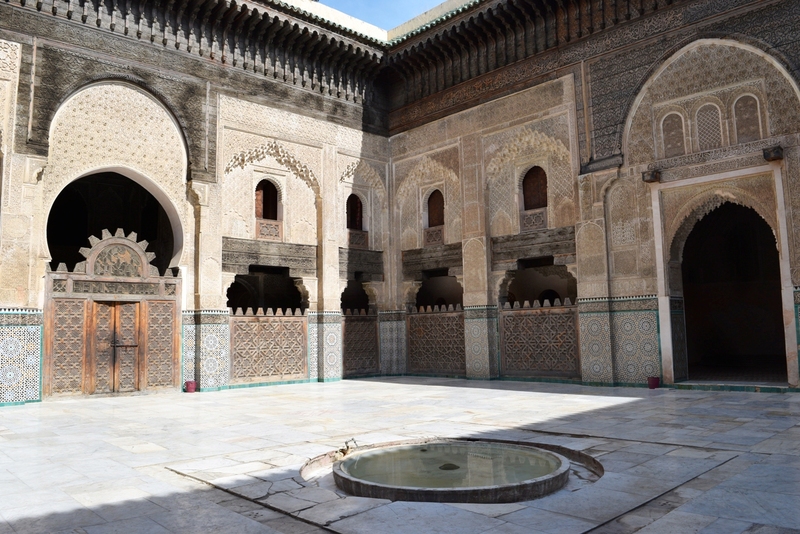 We then wanted to see the Madrasa Bou Inania, but that’s where the first problems appeared. It was nowhere to be found. After a short search around, we bought some cookies at the local bakery (hidden from the tourists) and decided to take a closer look at the map. I was still joyfully stuffing my face with a cake when a group of ten loudly laughing Spanish students appeared. “They might know,” Jure said and before I could empty my mouth to answer, he was already asking them for the directions. “The madrassa? Yes, we are headed there as well,” one of the guys told us. It took us less than a minute to reach the destination. The whole group was greeted by a well-dressed man, who introduced himself as a guide. 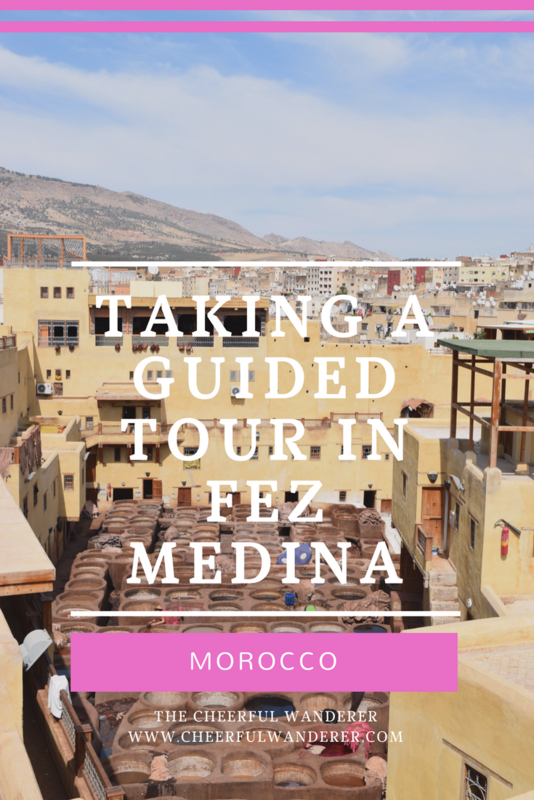 “Listen, the Medina of Fez is a labyrinth,” he started. “You’re going to get lost. For 150 dH, I can show you everything in four hours.” Considering there were 12 of us, that meant paying a bit more than €1 per person for a fully guided tour, but neither I nor Jure is fluent in Spanish so we had our doubts. Luckily, one of the Spanish girls had the same concern: “Ok, but the problem is there’s 10 of us that speak Spanish and 2 that speak English. What could you do?” It seemed like the guide didn’t see an issue. “No problem, I give you a tour in both languages, ok?” And that’s how we accidentally score an almost free private tour in one of the busiest Moroccan medinas. We first headed to the building we were already in front of, Madrasa Bou Inania. My photos truly don’t do justice to this stunning school. Believe me, it’s not famous for nothing. Unfortunately, we had less than 5 minutes to see it. “Yalla!” (let’s go), the guide started shouting before we were ready. This is where our real adventure started. After a short walk on the main street, the guide turned right. At this point, we all started to wonder where we are headed since all the main attractions were by the main path. Trying not to overthink, the group kept following a professional. He finally stopped by an old building with lovely handcrafted wooden doors, where we were passed to a middle-aged owner of the shop. While some of us had absolutely no interest in any of the items, others took close to half an hour for shopping. Not even 10 minutes after being back on the streets, we were at the rooftop of Dar Kettanine. 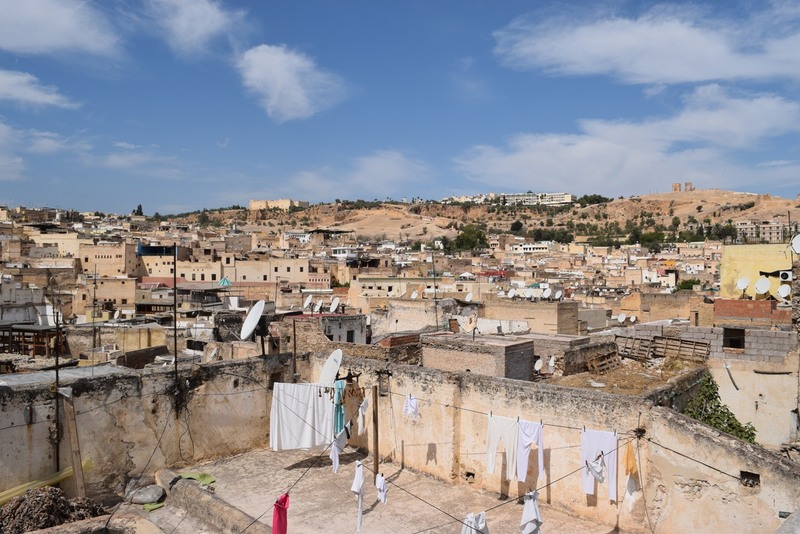 The views were some of my favorites in Fez, but I’d still highly advise against going there on your own. We were lucky to be amongst other students. All of us kept telling the vendors we were flying ryanair so their carpets REALLY CAN’T go with us. They weren’t too pushy – which is usually not the case. However, I haven’t read any positive reviews about this place. At this point the Spanish were getting more and more annoyed, telling the guide we hadn’t signed up for the shopping tour. “Have patience, ok?” he defended himself. 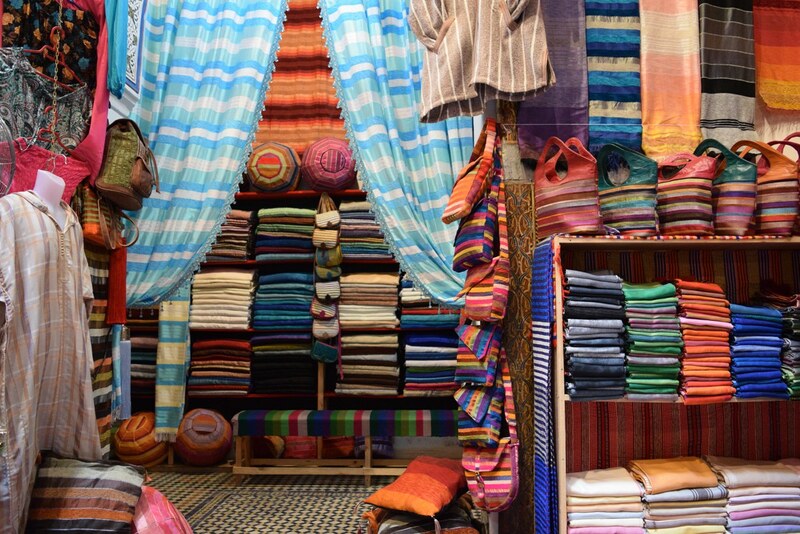 We were then taken through the busy market to the shop that specifies in scarfs. The owner took us around, explaining all about the process of making the scarves and demonstrated how to make a turban. He was fluent in English and very informative but looked insulted as soon as none of us bought anything, although he had specifically mentioned it was fine if we just looked around. Outside we noticed the sun was already high up. It was afternoon. We were all tired, thirsty and impatient. When the guide announced we had only one more stop to make, the Spanish could no longer contain their anger. They started arguing, telling him we had only seen the shops and he had not been sticking to the deal. He took their words very personally, explaining he was a certified guide, who had been in this profession for decades and we needed to trust him. Looking back, these were just the empty promises to keep us quiet. 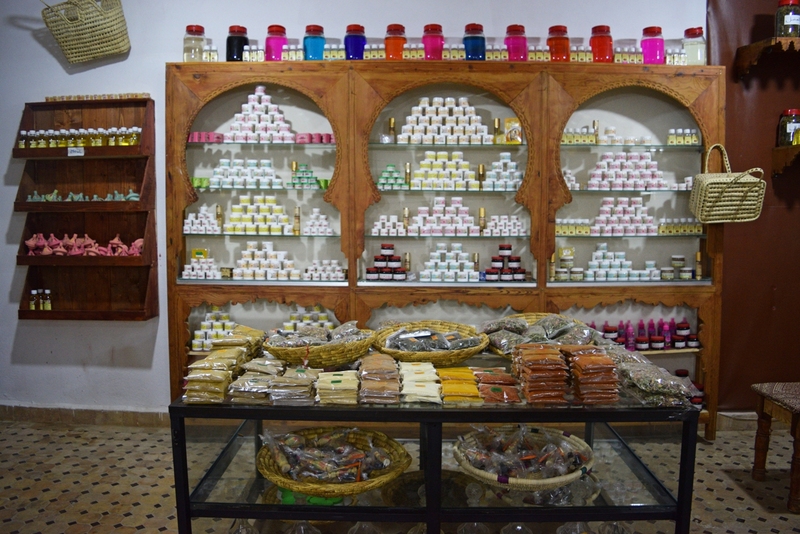 Our last stop was at a Moroccan pharmacy, where they were selling argan oil, spices, and different herbs. After the pharmacy, Jure and I were on our own again. 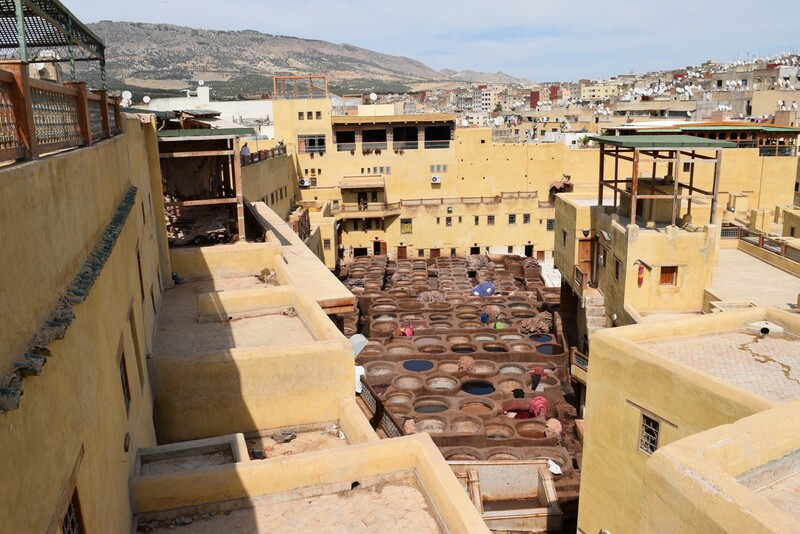 The last attraction on our list was the Chouara tannery, which is over 1000 years old. For the view, we chose shop #11 based on tripadvisor recommendation and I highly recommended it. Although the technology kept developing, the process of dying the hides of cows, sheep, goats, and camels, has bearly changed since the medieval times. All hides are dyed with natural ingredients, hence the smell. They are first soaked in a mixture of cow urine, quicklime, water, and salt. That helps to tough leather, loosen excess fat, flesh, and hair that remain on them. In the next stage, the hides are soaked in another set of vats containing a mixture of water and pigeon poop. Pigeon poop contains ammonia that acts as softening agents that allows the hides to become malleable so they can absorb the dye. The tanner uses his bare feet to knead the hides for up to three hours to achieve the desired softness. Any volunteers? Using the natural substances, such as poppy, indigo, henna and more, the tanners then color the hides. Watching the workers dying the leather in the vat and then stepping in barefooted to get it out, is a truly special experience. If you’re thinking of hiring a guide on the street, you should expect the same scenario. With ours, we have discussed the attractions we wanted to see beforehand, but that didn’t really help. Jure and I have no regrets at all. The tour was interesting, different from what we imagined but since it wasn’t a part of our original plan, we had absolutely no expectations. Unlike us, the Spanish were very disappointed because they had experienced the same thing a day before with another guide. Be careful. I suggest you hire a guide using your riad or tripadvisor instead. When their reputation is in your hands, they can’t afford to fool you.